How Far is Saturn from the Sun? Saturn’s distance from the Sun is 1.4 billion km. The exact number for Saturn’s average distance from the Sun is 1,433,449,370 km. Need that number in miles? Saturn’s average distance from the Sun is 891 million miles. Noticed that I said that these numbers are Saturn’s average distance from the Sun. That’s because Saturn is actually following an elliptical orbit around the Sun. Some times it gets closer, and other times it gets more distant from the Sun. When it’s at the closest point of its orbit, astronomers call this perihelion. At this point, Saturn is only 1.35 billion km from the Sun. Its most distant point in orbit is called aphelion. At this point, it gets out to 1.51 billion km from the Sun. Astronomers use another measurement tool for calculating distance in the Solar System called “astronomical units”. 1 astronomical unit is the average distance from the Earth to the Sun; approximately 150 million km. At its closest point, Saturn is 9 AU, and then at its most distant point, it’s 10.1 AU. Saturn’s average distance from the Sun is 9.6 AU. We have written many articles about Saturn for Universe Today. Here’s an article about how NASA’s Spitzer space telescope discovered a huge ring around Saturn, and here’s a cool movie of an aurora around Saturn. 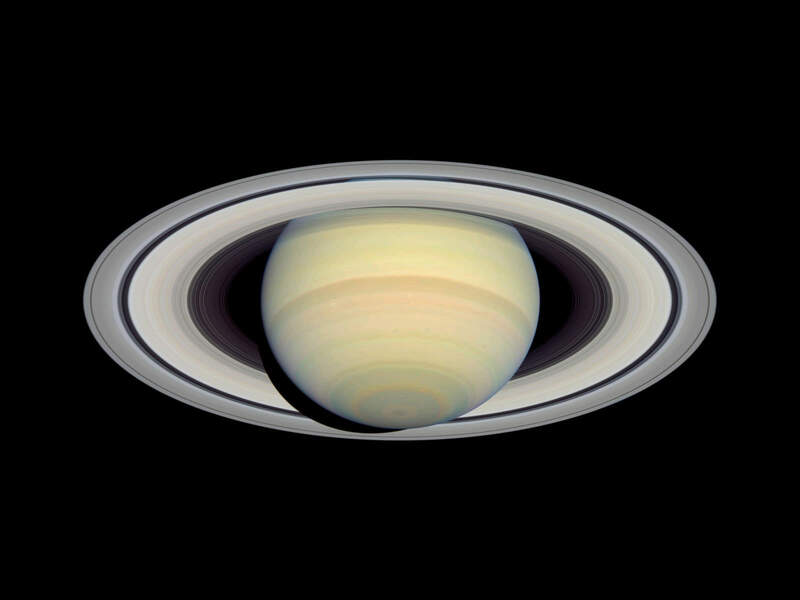 If you want more information on Saturn, check out Hubblesite’s News Releases about Saturn. And here’s a link to the homepage of NASA’s Cassini spacecraft, which is orbiting Saturn. We have also recorded an entire episode of Astronomy Cast just about Saturn. Listen here, Episode 59: Saturn. Next PostNext How Far is Uranus from the Sun?